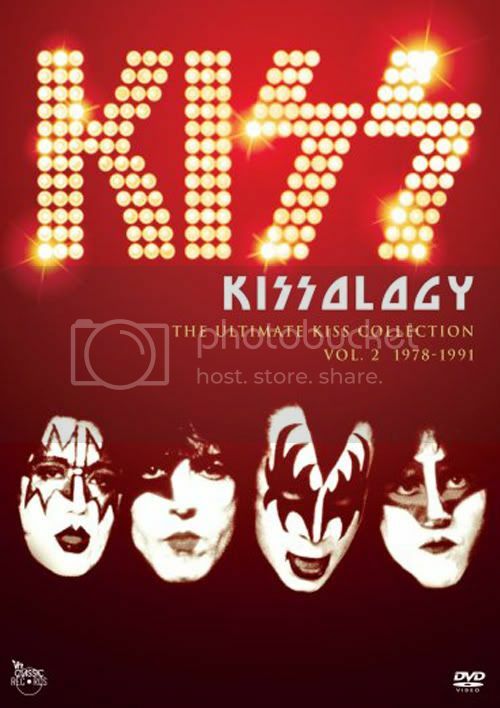 Buy, Rent or Skip KISS: Kissology - The Ultimate Kiss Collection - Vol. 2 (1978-1991) ? This is drastically different from the US Version of KISS Meets The Phantom Of The Park, in that it has additional never before seen footage as well as "sweetening" the music with songs from the Solo albums. I wasn't really paying all that much attention to the movie until I heard Ace Frehley's "Fractured Mirror". Then I realized that ok, they have tinkered with it, and perhaps made this a more enjoyable experience. One thing I noticed during the bands initial performance on stage, when they are singing "Shout It Out Loud", is a different version. Immediately I knew that they had swapped out the old version and replaced it with the newer, better version that's on the KISS: The Second Coming DVD. This version of the song is my all time favorite and I don't object to them replacing it. Once again. They want to make it a better movie. Another scene that they drastically altered was the inclusion of Gene Simmons "Radioactive", where he attacks the security guards. When the song kicks in, I had a giddy smile because the song itself made the scene so much better. The song has always been a favorite of mine, so it was like it finally got a proper "music video" of it. Another scene greatly improved was the inclusion of Ace Frehley's "New York Groove" during the KISS-fight-the-white-monkeymen-next-to-the-roller-coaster scene. Well, "improved" is a general term here. With all the new scenes and music added to the European Cut of the film, it's a much better film then the US version. Don't get me wrong. It's still a bad movie with bad acting, bad dialogue, cheesy special FX. But it's so bad that it's now campy. When I first picked up Vol. 2, I just skipped the movie and went onto the good stuff. Now that I have watched this version, I'm gonna have to bust out the US VHS copy to compare versions. A drunk Ace going head to head with Tom Snyder is good. Tom, Ace, Peter, and Paul were clearly having fun doing this interview, while Gene was on the verge of tears because he was steaming with anger at not being able to control Ace. Loooove it. YouTube it if you want to see for yourself. Check next Post for the clips if you're too lazy to search yourself. You're welcome. This is where they introduced, my all time favorite drummer into KISS: Eric Carr. Ace may or may not be drunk again. But he is entertaining as hell. Rockpop (September 13, 1980) "She’s So European", "Talk To Me"
Unmasked Tour - Sydney Showground - Sydney, Australia – (November 22, 1980) "Full Concert"
I'm not a fan of the Unmasked or the Dynasty tours at all. But this concert was pretty solid from top to bottom and is pretty close to a full show. Great set list. Any set list that includes both "2,000 Man" and "New York Groove" is a good thing. Fridays – (January 15, 1982) "The Oath", "A World Without Heroes", "I"
This is really cool to see. About the only Promotion stuff for The Elder. I've seen some other stuff, but the quality is nowhere as good as these performances. Top Pop – Dutch TV Show - (November 1982) "I Love It Loud"
Creatures Of The Night Tour - Maracana Stadium - Rio De Janeiro, Brazil (July 18, 1983) "Full Concert"
This is far from what you would call a concert. It's poorly edited together, and runs only 7 songs. This pisses me off because I would have liked to have seen a full concert of what is arguably the best KISS record: Creatures Of The Night. The significance of this show was that it was the last one in make-up before they became Glam Metal in the 80's. I still remember this day like yesterday. I was channel surfing and came across MTV and JJ Jackson said coming up next: KISS. I didn't know what they were doing on MTV. So of course I stayed and when they came back and announced they were taking the makeup off, I nearly tripped trying to turn the volume up. Weird that I hadn't heard anything about this. No hype. Nothing. First thing I said when they were revealed, "Gene is phucking ugly. Put the make up back on". It would have been nice to get the entire interview along with the new video: "Lick It Up" in this. Oh well. Lick It Up Tour - Cascais Hall: Lisbon, Portugal – (October 11, 1983) "Creatures Of The Night", "Detroit Rock City"
First show without makeup. They really should have released the entire concert and not just 2 songs. Crazy Nights Tour - The Spectrum: Philadelphia, PA – (December 18, 1987) "Full Concert"
5 songs is not a concert. Really doesn't make sense why they would hype this as being a concert. Arggghh. Hot In The Shade Tour - The Palace At Auburn Hills - Detroit, MI – (October 14, 1990) "Full Concert"
After dealing with the so-called concerts of Lick It Up and Crazy Nights. The Hot In The Shade Concert is more like it. A 21 song set list. It's got pretty much every song from every incarnation of the band up to this point. This show looks and sounds great. MTV announces the passing of Eric Carr. As before the Video and Audio is up and down on some of the older footage. But once you get into the late 80's - 90's stuff and the bonus disc, the video and audio sound fantastic. You need to play them LOUD. On the 3rd disc, watch all the way to the end of the credits to reveal a bonus footage of Eric Carr in hospital. Very sad moment that only Eric could make light of and have you walking away with a smile on your face. R.I.P. On 3rd disc, highlite KISSOLOGY logo to play a Gene Simmons and Mark St. John interview. Way too short. There's nothing on this guy for whatever reason. Poor guy. R.I.P. Horrible video and crappy audio. Lame set list and as always, drastically edited. My biggest pet peeve with Vol. 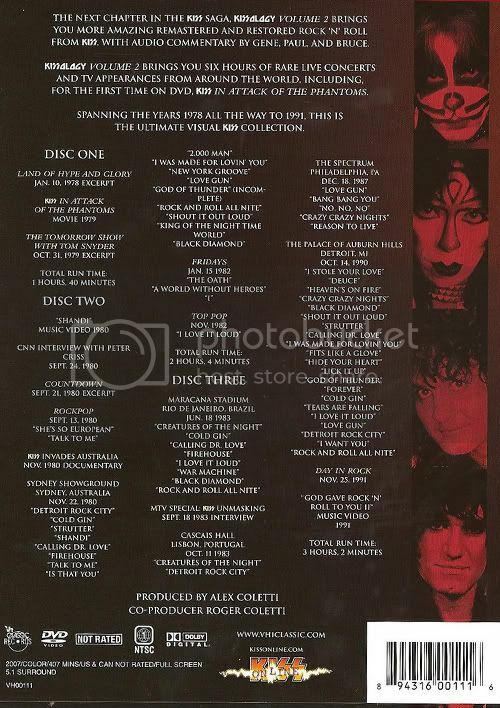 2 is that Gene and Paul are once again trying to re-write history by completely omitting the Lick It Up, Animalize, and Asylum Tours. When I first heard about these volumes coming out, Vol. 2 is the one I was looking forward to the most to complete my concert collection. Denied. Even with this gross disservice, overall Vol. 2 is better than Vol. 1, even though they have the same star rating. Watching Ace talk still cracks me up. Funny stuff. FYI, Vol. 2 is a definite Buy.